is a scientific publication containing research article, case report and review article in Law area. 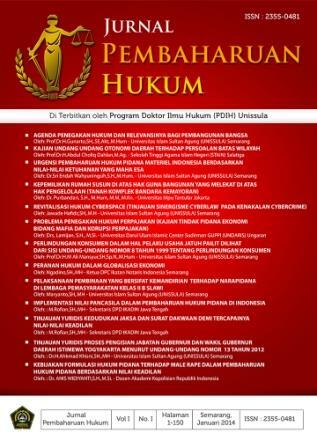 This journal is published by the Faculty of Law Universitas Islam Sultan Agung three time a year. This journal gives a good opportunities for law researchers, lecturers, students, practitioners that came from Indonesia and abroad to express the idea about technology and update in law. The aim of this journal is to develop and improve knowledge especially in law area. Please do not hesitate to contact us if you have any further questions or concerns.